Laser Gun 2-Piece Set Just $34.99! Down From $70! PLUS FREE Shipping! You are here: Home / Great Deals / Amazon Deals / Laser Gun 2-Piece Set Just $34.99! Down From $70! PLUS FREE Shipping! Head over to Amazon to score this Laser Gun 2-Piece Set for just $34.99 down from $69.99 PLUS FREE shipping! 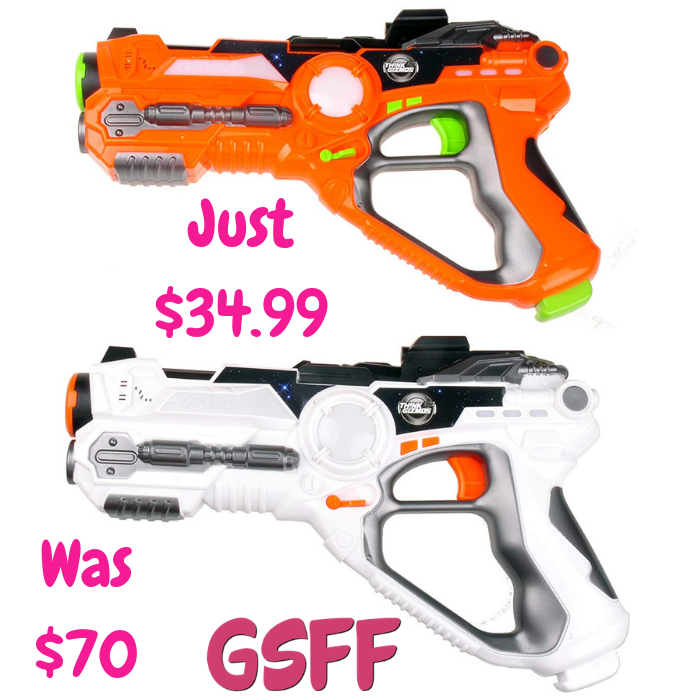 The kids Laser Gun Set includes 2 cool blasters and no extras other than batteries are required. It is part of ThinkGizmos Awesome Action Toy Series. Up to 4 different teams can be select on each blaster and there is no limit to the amount of people each team can have all the need is a blaster. Each gun can also switch between 4 different gun types which do different damage, have different magazine sizes before needing reloading and different range to add to the tactical play. Includes built in lights and sounds for different gun types and damage and also when reloaded with the reload button on the gun it has a reload sound. Awesome lazer gun set for kids and adults that includes everything needed to play including two different coloured guns and batteries. No extras required such as extra vests, the guns are your versatile weapons and also the target you aim for. Up to 4 different teams and multiple weapon types can be selected on each gun plus manual reload button. Children’s toy which conforms with ASTM F963-16 standards and certified class 1 laser toy product with less than 1mW output and infrared range of over 120 feet. Made from safe, strong and durable plastic built to last. Can have unlimited number of players on each team so can have super large battles.